I've decided to spend a little time reviewing books as I read them as a means to be helpful and encouraging for you to find interest in them if they will benefit your life or situation. Today, however, I have felt pulled to go back to a book I read in 2015 called The Four Seasons of Marriage by Gary Chapman. The reason this has been on my mind and heart recently is because Love & Respect's author Emerson Eggerichs and his son Dr. Jonathan Eggerichs recently shared a three part podcast covering The Four Seasons of Marriage that I thought was excellent, making me feel prompted to share and suggest both this book and podcast series to anyone married or in a relationship, regardless if you're in a state of bliss or despair. I'll list the Love & Respect's podcast links covering this topic at the bottom of this post. As in all relationships we so easily forget that marriage is hard work, and will go through ups and downs. We forget that there are very distinct seasons that our relationships will go through and not always in the precise, logical order of spring, summer, fall, winter. Knowing that these seasons exist is one of the best ways to safeguard your relationship because you'll be on guard and equipped to work harder when needed and not let your marriage fail. The basis of the book is centered on the four seasons of the year: winter, spring, summer, and fall. The descriptions of these seasons for marriage provides the perfect metaphors that you would picture in your head correlating to the seasons. The winter season is the toughest season in marriages because it is characterized by coldness, bitterness, and harshness just as you would imagine winter weather to be like. In this season couples have difficulty communicating with one another because both have been hurt, feel angry or disappointed and thus are unwilling to work with each other for common goals or desires. There is an air of frigidity between the two which greatly exacerbates the distance between the couple and almost everything feels negative or discouraging. Gary Chapman notes that in this season, whether consciously or subconsciously, your actions (harsh words, withdrawal, silence, violence) are meant to be hurtful and destructive to your spouse. The spring season is one of the best seasons in marriages because it is characterized by excitement, joy, and hope. In this season couples have just gotten married or have reemerged from a winter season and feel optimistic and excited again. Newly married couples have the anticipation of growing closer together, starting their new life together, potentially children. There is a lot of communication between the two about these goals, planning, and nurturing the goals created together. The spouses are feeling loved and expressing love, gratitude, optimism, and trust. 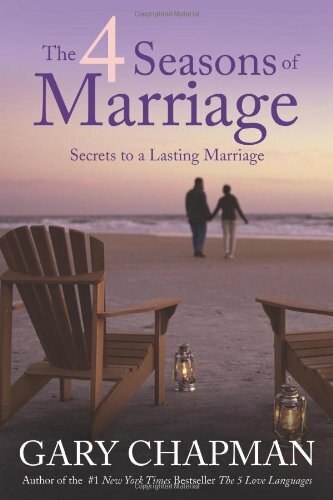 Gary Chapman says something very important in this section, "Marriage is not a lifelong springtime, but we can come back to the optimism, enthusiasm, and joy of spring many times in the course of our lives." Loving with intention is the key to returning to the spring season in your marriage once it is off track. The summer season of marriage is characterized as feeling happy, content, accomplished, connect to each other, and basically cruising along through life together. There is a sense of trust, a relaxed atmosphere of letting your spouse be who they are and celebrating differences, while feeling committed to growing stronger together. This is a very enjoyable time together, however it is time to take some caution as patterns begin to be set into place which can lead to unresolved conflicts that are swept under the rug to keep everything humming along until one day those unresolved issues begin to surface. This brings us to the final season of marriage called the fall season. Gary Chapman describes the fall season with effective, vivid imagery that literally gave me chills because I have (unfortunately) experienced it too. In the fall as the temperatures lower and the leaves begin to change colors there is great beauty to be admired in the autumnal colors. In the weeks that follow the chilled air begins to set in and the leaves begin to fall leaving the trees barren as the winter season rolls in. He likens this to how at the beginning of a fall season people believe someone else's marriage to be beautiful and working well, but on the inside the couple knows that there are issues settling in. The imagery here is compelling to me. The couple feels rejection, fear, sadness, loneliness, and even emotionally depleted. The couple may feel concerned about the state of their marriage and concerned about the future, but the number one contributing factor to the fall season is neglect within the marriage and assuming the issues will sort themselves out. This breeds a sense of emptiness and detachment thus causing the feelings of fear, rejection, etc. listed above. Once you finished learning about the four seasons of marriage, there is a "Marital Seasons Profile" questionnaire to help you assess which season you fall in, if you don't already recognize it! Gary Chapman provides seven strategies to enhance the seasons of marriage you might be in. I'm only going to list them below as I do not want to give away some of the best tools provided in the book. I want to encourage you to read it instead! You will find detailed information on ways that you can turn your marriage around, move through and out of fall and winter seasons, and restore or regain spring and summer seasons. The final chapters of the book summarize all of the above, but also provides a Q&A section that will be helpful for many to relate to their personal situations. I find the Q&A to be helpful also because it will also provide additional flags you may recognize early as you move into another season or that you recognize happening in someone else's relationship and can thus step in to provide a useful tool like this book. The very back of the book has a study guide you can utilize to grasp all of these concepts more in depth. I recommend this book to everyone, married or not. The seasons are applicable to non-married relationships as well, especially those that last over a year. The important thing to remember once you learn about the seasons and the strategies is that moving in and out of the seasons is normal AND that you do not have to stay stuck in a season forever. There is hope. There is light. You can restore your relationship/marriage. God designed us as relational people and God designed marriage for us to make a covenant vow to each other to work together through all of the highs and lows that life can bring. Knowing that a season doesn't have to last forever is hope in itself, and sometimes that is all you may need. Hope. Lastly, below are the three podcasts by Love & Respect's Emerson Eggerichs and his son, Dr. Jonathan Eggerichs on the four seasons of marriage. If you found this post interesting or if it perhaps reminded you of someone please share it! And don't forget to subscribe to my site below so you don't miss out on any future posts.